Waddles Wanders: Can I tell you a secret? It's been a while since I posted and I will explain in a later post but today I want to tell the small humans a secret. A big huge massive secret. About me. Last weekend I was a scared penguin. I don't think I've ever been scared of anything other than Mammy Penguin when she's super cross but that's a story for another day. I was terrified on Friday. I know I'm usually such a brave penguin, I left my home and moved to Ireland so I know I'm quite brave. And I was terrified, I've never seen a human with such a large foot, I thought it was a monster. I don't think I like monsters. They are scary and strange and feet that big must belong to the biggest monster ever! I was with my human Helen but she was no good and just laughed at me. Which by the way Helen is just mean, you shouldn't laugh at scared Penguins. Sorry Waddles....But it was really funny. I hate it when Helen pops into my blog and writes stuff, but at least she writes in blue so you know it's not me. Anyway I was terrified and it was about to get worse. The footstep belonged to a giant with a giant foot!! HUGE isn't she?? I was almost screaming in terror and the meany pants human just kept laughing and going closer and closer to her. I wanted to hide. 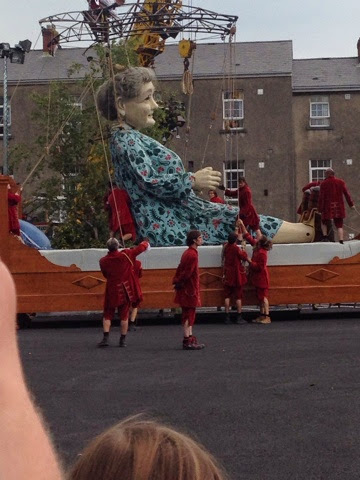 The giant was a granny, she was lovely but poor Waddles really was very afraid of her. 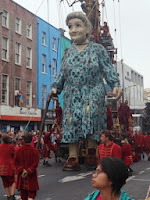 The giant granny walked around Limerick all day, her giant feet stamping around and scaring me. I thought she was going to eat me. 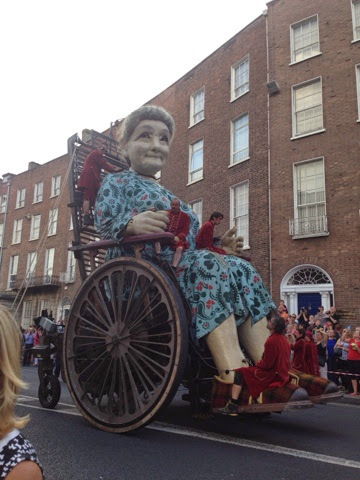 I don't want to be giant granny food!!! I tried to give her a penguin bar instead but did something very rude, she made a noise out of her bottom....Helen says I'm not allowed to do that so why can Granny? She was so scary. And even worse when she got into a weird giant chair. She took some humans onto her knee and kidnapped them. She didn't kidnap them, they were her helpers and she let them ride along on her chair Waddles....silly penguin! Helen get off my website you bold human!! 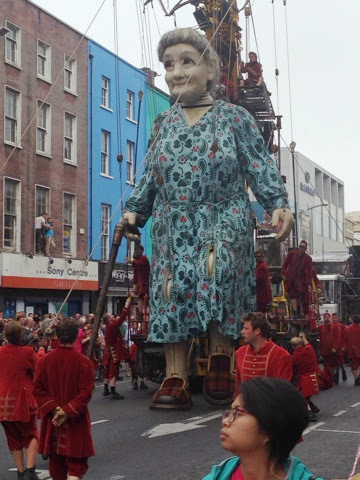 I thought Granny was real but Helen told me she wasn't real, that she's a puppet and the humans dressed in red take care of her and help me move around with strings and stuff. I wasn't scared anymore. I'm not scared of a puppet. I'm only scared of real scary giant monsters. And Granny isn't a monster. But she is very bold. She made rude bum noises and made a mess on the floor, I don't think Limerick has a giant toilet big enough for her bottom...but I think she's very naughty to think the street is a bathroom!! Bad Granny! I did like it when she went to bed, she has a giant bed! She needed all her red helpers to help her into bed but she did look so cosy and comfy in there! 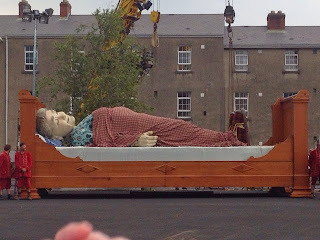 Doesn't she look happy in bed? I love my bed and I think Granny loves her bed. 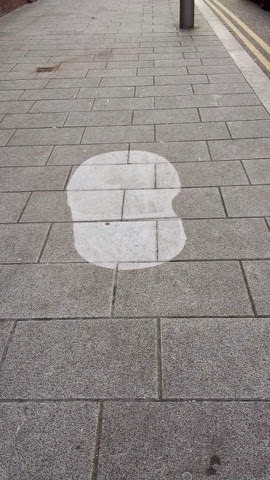 It must have been exhausting walking around Limerick all day. I did learn something very important though, it's ok to be scared of stuff. I thought it was bad and that it meant I wasn't a brave penguin but Helen says being brave doesn't mean I'm not scared of anything it means doing something even though I'm scared. So even though Granny terrified me I stayed and watched her and once I learnt she wasn't real I wasn't afraid anymore. I think that's a really important lesson to learn and while I didn't like feeling scared I am glad I learnt it.